Editor’s Note: In the spring of 2015, the official publication of the Association of Firearm and Tool Mark Examiners (AFTE) featured an article by Lucien C. Haag entitled “The Missing Bullet in the JFK Assassination.” The article was the last in a series of three discrete analyses in which Haag, a criminalist and long-time AFTE contributor, examined ballistic evidence from each of the three shots fired by Lee Harvey Oswald in Dealey Plaza. In the two previous articles, Haag, with admirable clarity, and by drawing from the work of others (notably Dr. John K. Lattimer and Larry M. Sturdivan), confirmed yet again the rational consensus: the second shot fired hit President Kennedy in the upper back before seriously wounding Governor Connally, and the third shot pierced the rear of the president’s head. In sharp contrast, Haag’s article on the missing bullet (aka the first shot fired) had serious deficiencies. Technical, evidentiary, and logical flaws in Haag’s shooting reconstruction analysis invalidate his conclusion as to how the first shot fired by Oswald missed its intended target. The following critique is adapted from a letter sent to the editor of the AFTE Journal, which is online but behind a paywall. The letter appears in the journal’s Fall 2016 issue, along with a response from Haag. To determine why or how Oswald’s first shot missed, Lucien C. Haag empirically tested all four reasoned possibilities that have been put forward since the 1963 assassination. The bullet might have been deflected by 1) the branches of an oak tree; 2) a traffic signal light; 3) the mast arm of the signal light; or finally, 4) the bullet simply missed and struck the asphalt pavement of Elm Street. During the investigation following the assassination, Secret Service and Federal Bureau of Investigation agents thoroughly inspected the oak tree that partially obscured Oswald’s line of sight down Elm Street. They found no evidence that branches had been struck by a bullet fired from Oswald’s rifle. The Warren Report, nonetheless, still claimed complete deflection by the tree branches was a possibility. Haag designed and conducted his own tests to determine, once and for all, if the tree branches in question had the capability to deflect a pristine 6.5mm-FMJ bullet fired from a Mannlicher-Carcano rifle. This study was sensible because notwithstanding the lack of evidence, lore about an oak tree branch deflecting the first shot had become a widely-accepted explanation in the decades since the Warren Report. Tree branches destabilized, but did not redirect, a full metal- jacketed bullet fired from a Mannlicher-Carcano. Haag’s testing approach here was well planned, and first reported during a PBS-NOVA documentary, “Cold Case JFK,” which aired in November 2013. The results revealed that bullet deflections by oak tree branches, such as those that were in Oswald’s line of sight, are minimal, although the impact is sufficient to destabilize a jacketed bullet. This was not a surprise finding given the high kinetic energy of a projectile fired from a Mannlicher-Carcano and the low impact resistance of a tree branch. A bullet fired through the branches of the oak tree on 22 November 1963 would have either struck passengers in the presidential limousine, and/or the limousine itself, or terminated in the Elm Street asphalt. The possibility that a traffic signal light at the intersection of Elm and Houston Streets might have deflected the bullet was first raised in “JFK: The Lost Bullet,” a 2011 National Geographic documentary. A Secret Service photograph taken during its 27 November 1963 assassination reenactment revealed a “possible bullet hole” in the signal light’s bottom right back plate. The authors, Frank DeRonja and Max Holland, were two of the consultants in the documentary, and conducted firing tests on exemplar signal lights to study this discovery. These tests showed a bullet strike caused obvious and extensive damage to the signal light and therefore the signal light was eliminated as a possible obstruction to Oswald’s first shot. In addition, the “possible bullet hole” was determined to be a small gap between the signal light and where the back plates were joined. These findings were presented in the interim DeRonja-Holland Report, which was published online to coincide with the premiere of “JFK: The Lost Bullet” in November 2011. The signal light assembly that obstructed Oswald’s view. Haag portrayed the signal light deflection as a hypothesis that was still in need of testing and he was free to do so. Scientific analysis depends on reproducible results, and it was appropriate for him to conduct his own tests. However, what Haag should not have done is falsely claim that the signal light hypothesis has been disproved only now, via the tests he designed and conducted. All Lucien Haag actually accomplished was to repeat what the interim DeRonja-Holland Report found and reported four years earlier. Having ruled out oak tree branches and the signal light as obstructions to Oswald’s first shot, Haag next addressed the possibility that the horizontal signal light mast arm overstretching Elm Street caused the deflection, an explanation first proposed by Washington Decoded in 2007. To study this theory, Haag conducted firing tests on steel samples described as cylindrical poles. The samples used in these tests differed significantly from the mast arm component of the signal light assembly, which was a steel pipe two inches in diameter. Haag’s samples were not only larger in diameter, but also differed in wall thickness. In addition, the firing test arrangement, as depicted in Haag’s Figures 14-17, did not replicate the orientation and angular position of the mast arm relative to the sixth floor window. Haag’s firing tests, however, still yielded useful data. Indeed, he correctly concluded from the testing that any bullet impact other than a shallow grazing strike will leave obvious damage, anything from a deep groove to total penetration. But a “very shallow grazing strike” to a cylindrical steel surface by a bullet fired from a Mannlicher-Carcano results in a ricochet deflection with barely discernable damage to the metal surface, and with little loss of bullet velocity and no fragmentation of the bullet core. Haag jumped to the conclusion that the mast arm could not have been struck by Oswald’s first shot because DeRonja found no observable bullet imprint damage on the mast arm. But Haag was too hasty in dismissing the possibility of a deflection by a “very shallow grazing bullet strike.” He ignored the fact that such a glancing strike would have removed protective paint from the mast arm, permitting rust corrosion to commence. Metal rusting would have obliterated and destroyed a very shallow bullet imprint in an estimated 12 years, meaning that examination of the mast arm five decades later was all but doomed to fail to find a bullet imprint. A thorough discussion and analysis of a grazing bullet ricochet strike to the signal light mast arm can be found in a May 2016 article by authors DeRonja and Holland in the online, open-access journal of the Association for Crime Scene Reconstruction. Haag's testing showed a bullet strike to the asphalt leaves a large visible crater. The empirical results here were problematic, however. Nobody saw such an eruption in the asphalt on Elm Street. It wasn’t because there was a lack of potential witnesses. As frame 138 (below) from the Zapruder film reveals, at least three dozen eyewitnesses (if not more) lined both sides of Elm Street and were in a position to notice a pavement-damaging debris cloud. Yet no one in the vicinity ever directed law enforcement personnel, who had instantly swarmed into Dealey Plaza, to the Elm Street asphalt. An onlooker near the traffic light signal later testified that she saw something bounce off of the pavement in the left lane. But her description cannot honestly be confused with witnessing a pristine, high-velocity bullet strike to the asphalt, and subsequent cratering at the point of impact. To explain the complete absence of evidence, Haag engaged in conjecture at odds with an empirically-based analysis. Haag asserted—without any experimental testing—that the tell-tale crater would only have lasted a few days. He stated that any efforts—even on the very day of the assassination—to locate pieces of a fired bullet at or near any “fresh” damage site on the Elm Street asphalt were destined to fail. The reason given was that such bullet-caused defects in asphalt quickly morph “into nothing more than a vague depression” and re-acquire the general color and appearance of the adjacent asphalt as a result of traffic, rain, street sweepers, etc. Haag’s assertion here appears to be based on observations described in his co-authored book, Shooting Incident Reconstruction (2nd ed. ), specifically, the chapter on “Projectile Ricochet and Deflection.” Figure 9.13 in the chapter depicts a “Classic impact in asphalt displaying the ‘fresh’ look that can disappear in days for a variety of reasons.” There is no question that slight surface damage to asphalt pavement by a ricocheting bullet strike may be difficult to see immediately afterwards, and can “disappear” in a relatively short time. But Haag’s use of that fact as an explanation for the disappearance of asphalt cratering from Oswald’s first shot is technically wrong. Crater damage to asphalt from a direct, non-ricocheting bullet strike will not and cannot vanish because of the creation of internal crack formations within the asphalt. Cracks in solid material can only propagate and grow larger with time, and in asphalt, a small crater can only grow into a pothole as the asphalt disintegrates. The crater cannot vanish. Moreover, it did not rain until days after the Secret Service’s restaging of the assassination on Wednesday, November 27, and the extensive preparations for this reenactment that occurred on Monday, November 25. On these two days agents and Dallas police spent hours scrutinizing the path taken by the presidential limousine through Dealey Plaza, which was blocked off from traffic for hours; surely a freshly-formed asphalt crater would have been noticed. Still pictures were taken on November 27 of every foot of the roadway, and the high-resolution versions of these photographs (available at the National Archives) show no evidence of an asphalt crater. It is worth noting that within 20 minutes of the assassination, eyewitnesses did lead law enforcement personnel to the two locations in Dealey Plaza where a bullet (or portion thereof) struck the ground. The first location (expressly identified as occurring at the instant the first shot was fired) was the turf adjacent to a concrete skirt/manhole cover on the south side of Elm Street, about 325 feet west of the traffic signal light. The second location was further downrange: a concrete curb on the south side of Main Street about 24 feet from the triple underpass. Later, the Secret Service and FBI investigated both locations in detail, and their findings are included as Warren Commission exhibits. A policeman points to where a bullet struck the ground adjacent to the concrete skirt on Elm Street in a news photo that was widely published on 23 November 1963. These two strikes on the ground were no secret from the public. Local news photographers captured both locations on film within a day of the assassination, and local newspapers published stories and/or pictures about the locations in the days and weeks immediately after the assassination. To believe Haag’s claim is to believe that eyewitnesses were able to guide lawmen instantly to relatively subtle evidence of bullet strikes, while what would have been the most obvious impact point—an alleged volcanic eruption on the asphalt—was inexplicably missed. This argument was imaginative but not logical. Haag spent the balance of his article discussing the injury to Dealey Plaza eyewitness James Tague, and how it could be accounted for by a fragment from the third and final shot, which struck President Kennedy in the head. This discussion is remarkable for the contradictory factual information that was left out, presumably because Haag was unaware of it. The first undisclosed fact is that in Tague’s sworn testimony before the Warren Commission, he said that shots were fired after he was injured. Although witnesses can be mistaken, this testimony alone severely undermines the notion that a fragment from the third shot was responsible for Tague’s wound. And there is more. The scratch on James Tague’s left cheek. Tague’s injury was discovered in tandem with the bullet strike to the Main Street curb; he had been standing about 20 feet away from the curb, just in front of the triple underpass. The FBI Laboratory later conducted a spectrographic analysis of a metallic smear on the curb and confirmed that it was consistent with the core of a mutilated metal-jacketed bullet, such as the type that had been loaded into Oswald’s 6.5mm cartridges. This FBI report is extremely significant because it is one of the few pieces of dependable contemporaneous information about the shot that missed. Nowhere in Haag’s article did he address how the proven bullet strike to the Main Street curb fits his preferred hypothesis. Since the impact cannot be tied to the alleged pristine strike to the asphalt—according to Haag, such a bullet undergoes total destruction—one can only speculate how he associates the strike to the curb with the third and final shot. Haag, in similar fashion, did not explain the strike to the concrete skirt on Elm Street, which was expressly associated with the first shot and as such guarded by police until a department photographer could take pictures several hours later. This area of impact posed an insurmountable obstacle to Haag’s analysis and was ignored. He preferred to imagine a bullet strike that no one saw instead of accounting for impact evidence that was witnessed and recorded. An aerial view of Dealey Plaza in 1967, Corbis/Getty Images. Belatedly explaining how the first shot missed is admittedly a difficult task. At a minimum though, it requires a thorough understanding and incorporation of all reliable evidence, along with a willingness to engage in empirical testing to prove or disprove hypotheses. Facts cannot be discounted because they are inconvenient and contradict a preferred hypothesis, as Haag is inclined to do. Whether Haag was unaware of these facts, or consciously chose to omit them, knowing that few, if any, of his readers would know better, is ultimately immaterial. The result is the same: a “probable fate of the first missed shot” that does not stand up to scrutiny. Despite the absence of highly visible, dispositive proof, the only hypothesis that survives is the one that concludes the first shot fired by Oswald missed its intended target because the bullet was deflected by the signal light mast arm. The aerial view of Dealey Plaza (above, click to enlarge) has been altered to show the path of the first shot. A glancing strike to the mast arm stripped the copper jacket off and deflected the bullet core on a path to the ground near the concrete skirt on the south side of Elm Street; from there the core ricocheted toward and subsequently struck the Main Street curb where it ricocheted again to finally strike a column of the tripe underpass. The FBI Laboratory found metal residue on the Main Street curb consistent with the core of the ammunition used by Oswald. James Tague, who stood just to the right of the concrete column while looking at the presidential motorcade, was nicked on his left cheek, most likely by a tiny fragment of concrete dislodged by the bullet core. This explanation is the only one that is both empirically possible and reasonably accounts for all the documented evidence associated with the first shot. Frank S. DeRonja is a forensic scientist with more than 60 years of technical education, training, and experience that includes crime scene reconstructions. The holder of a Master of Science Engineering degree in Metallurgy from Columbia University, he entered the FBI as a Special Agent in 1964. He subsequently worked for more than 20 years at the Bureau’s Laboratory where he conducted evidence examinations in major cases, developed and applied new technologies to evidence examination methodologies, and served as a technical adviser and court expert for the FBI and the criminal justice system. Upon retirement from the FBI, he continued to provide forensic metallurgy and engineering services through his company Forensic Metallurgy Associates. He has been accepted as a forensic expert on more than 155 occasions in more than 30 states (federal and state courts); by a U.S. Senate Subcommittee; and in Puerto Rico and Canada. Max Holland, the editor of Washington Decoded, is the author of many articles about the Kennedy assassination. Haag’s test of pristine bullet strike to oak tree branches: “Cold Case JFK,” PBS/NOVA. Commission Exhibit 875: Warren Commission, Hearings, Vol. 17, 880. Haag’s test of pristine bullet strike on asphalt: “Cold Case JFK,” PBS/NOVA. Zapruder Frame 138: Zapruder Film © 1967 (Renewed 1995), The Sixth Floor Museum at Dealey Plaza. DPD officer pointing to bullet strike near concrete skirt in Dealey Plaza: Fort Worth Press, 23 November 1963, courtesy of Fort Worth Library. James Tague on 22 November 1963: William Allen, Dallas Times Herald Collection, The Sixth Floor Museum at Dealey Plaza. Aerial view of Dealey Plaza in 1967: Corbis/Getty Images. Lucien C. Haag, “Tracking the ‘Magic Bullet’ in the JFK Assassination,” AFTE Journal, Vol. 46, No. 2: Spring 2014, 104-113; Lucien C. Haag, “President Kennedy’s Fatal Gunshot Wound and the Seeming Anomalous Behavior of the Fatal Bullet,” AFTE Journal, Vol. 46, No. 3: Summer 2014, 218-223; Lucien C. Haag, “The Missing Bullet in the JFK Assassination,” AFTE Journal, Vol. 47, No. 2: Spring 2015, 67-78. The Warren Commission, in 1964, was the first to suggest that the branches of an oak tree might have deflected one of the shots fired by Lee Harvey Oswald. President’s Commission on the Assassination of President John F. Kennedy, Report (Washington, DC: Government Printing Office, 1964), 111. The possibility that the signal light overhanging Elm Street might have obstructed the first shot fired was initially raised in the 2011 National Geographic documentary “JFK: The Lost Bullet.” The likelihood that the mast arm of the signal light deflected the initial shot was first posited by Max Holland and Johann W. Rush in “11 Seconds in Dallas, Not Six,” Washington Decoded, 11 March 2007. This possibility was further explored in three subsequent articles; see Max Holland & Johann W. Rush, “JFK’s Death, Re-Framed,” New York Times, 22 November 2007; Max Holland & Kenneth R. Scearce, “11 Seconds Redux: Filmed Evidence,” Washington Decoded, 11 November 2008; and Max Holland, “The Truth Behind JFK’s Assassination,” Newsweek, 28 November 2014, 26-37. The theory that the first shot struck the asphalt pavement of Elm Street was addressed in the November 2013 PBS/NOVA documentary “Cold Case JFK,” which featured ballistics tests conducted by Lucien Haag and his son, Michael Haag. Gerald Posner, Case Closed: Lee Harvey Oswald and the Assassination of JFK (New York: Random House, 1993), 477. Haag, “The Missing Bullet,” 70-72. Frank S. DeRonja & Max Holland, “The Interim DeRonja-Holland Report,” Washington Decoded, 20 November 2011. Haag, “The Missing Bullet,” 71-73. Frank S. DeRonja & Max Holland, “A Technical Investigation Pertaining to the First Shot Fired in the JFK Assassination,” Journal of the Association for Crime Scene Reconstruction, Vol. 20: May 2016, 9-33. Haag, “The Missing Bullet,” 74. President’s Commission, Hearings, Vol. VII, 508-510. Haag, “The Missing Bullet,” 76, 78. Michael G. Haag and Lucien C. Haag, Shooting Incident Reconstruction 2nd ed. (San Diego, CA: Academic Press, 2011), 157-160. 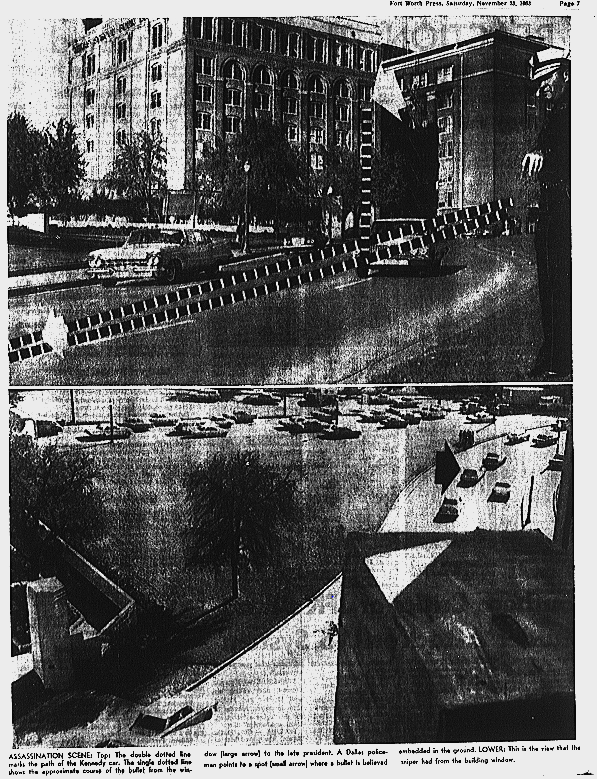 “Weather Index,” Dallas Morning News, 23-27 November 1963; “Secret Service at Scene,” Dallas Morning News, 26 November 1963; “Bullet Trajectory Studied at Scene,” Dallas Times Herald, 28 November 1963; Carl Freund, “Crime Re-enacted By Secret Service,” Dallas Morning News, 28 November 1963; President’s Commission, Hearings, Vol. XVII, 870-882. The high-resolution versions of these photographs are preserved at the National Archives in College Park, MD. US House of Representatives, Select Committee on Assassinations, Investigation of the Assassination of President John F. Kennedy: Appendix to Hearings, Vol. XII (Washington, DC: Government Printing Office, 1979), 23; President’s Commission, Hearings, Vol. VI, 252; Warren Commission Document 1518, National Archives, College Park, MD, 43, 45A. President’s Commission, Hearings, Vol. VII, 546-547, 553-555; Ibid., Vol. XXIV, 540; Ibid., Vol. XXI, 475-481; “Assassination Scene,” Fort Worth Press, 23 November 1963; “Concrete Scar,” Dallas Morning News, 24 November 1963; “Questions Raised on Murder Bullets,” Dallas Morning News, 13 December 1963. Haag, “The Missing Bullet,” 70, 76-78. President’s Commission, Hearings, Vol. VII, 555. Richard B. Trask, Pictures of the Pain: Photography and the Assassination of President Kennedy (Danvers, MA: Yeoman Press, 1994), 496-499, 554, 562. Anyone with competitive rifle marksmanship experience (mine began in 1966) knows Oswald used the first shot for the indispensable requirement of zeroing (sighting-in) his reassembled rifle, aiming at the south curb of Main Street and causing the “fresh bullet mark” seen by Deputies Walthers and Sweatt. It “missed” because it wasn’t aimed at the limo in the first place. Decades ago, I spent a pleasant day chatting with the late John Cahill. Had he been able to advise you on the final paper, my feeling is that he would have urged you to publish the velocity of your test ammunition. On another matter, I happened across Guinn's test on NAA. Way, way over my head. Worth mentioning,however, is that he used exclusively pistol and .22 ammunition in his comparison, save the exotically powerful .30 Nosler. Could the origin of the bullets be relevent? I ask because Lapua is Finnish and very superior quality. Curious that there no examples of other Winchester Western rifle bullets, nor milspec (military specification) rifle bullets at all. My last lends itself to an excessively conspiratorial interpretation. "Curious," indeed, but my guess is not instructions from The Conspirators, but a quick and simple _cheap_ study. NAA is used in bullet matching, meaning predominantly used for criminalistics; thus, bullets already analyzed would be overwhelmingly pistol bullets. My inexpert opinion is that this should be redone with milspec rifle bullets made by Western in proper era.